My father, Grover E. Journey, died on March 21 at a hospital in Mississippi. Mother and I were on the way to Mississippi when we got the word that he was gone. My brother had left a couple of hours earlier but it was a five hour drive; none of the family got there before Dad passed away. The service was held on Thursday, March 24, at Elmwood Chapel in Birmingham. Three Baptist ministers – Dad’s current pastor and two preacher friends he knew for decades – shared memories, prayer, and scripture. At Mother’s request the song “Going Home” was played — burned from a homemade audio cassette from the 80s of a scratchy gospel quartet vinyl LP from the 60s that Mother and Dad loved. My brother, Rick, assembled a beautiful video of visual images chronicling Dad’s life, set to Bob Seger’s “Like a Rock.” On the printed program were the lyrics to “The Far Side Banks of Jordan” that I knew from a Johnny and June Carter Cash duet on June’s final album, Press On. 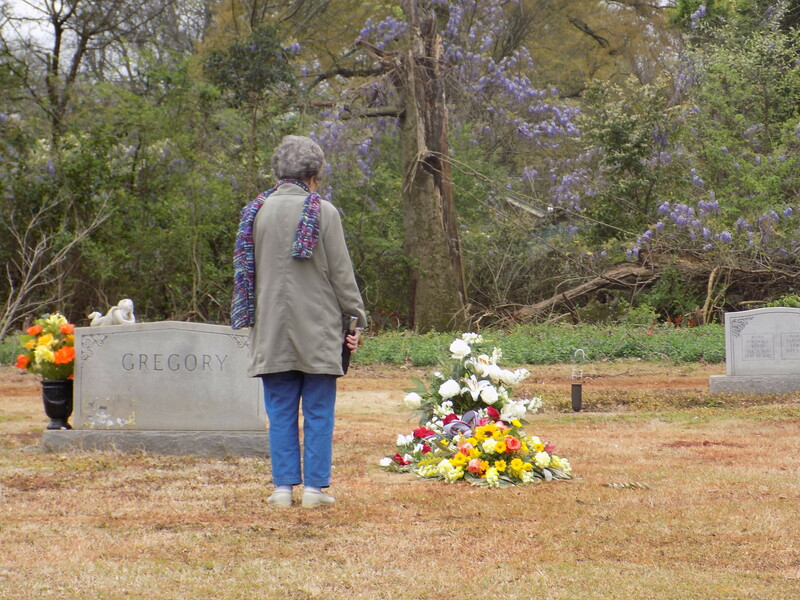 At the brief graveside service in Elmwood Cemetery, after the prayers and scripture, jazz trumpeter Chuck King stepped up to the casket and played “Yea, Alabama!” – the University’s fight song. At the end there was a chorus of “Roll Tide!” from the mourners. My Dad would love that final touch. His grave in Elmwood is not that far from Coach Bryant. It was a sad occasion but also a fitting celebration of a full and well-lived life. My brother introduced his video and there wasn’t really any discussion of a eulogy from me, although it was mentioned and I declined. My role was to help expedite the week as much as possible. The ministers and the video eloquently said most of what needed to be said. Jim McCain, a minister who was also a neighbor and decades-long friend, got in some witty quips in a very moving remembrance of Dad as a friend and “a good man.” My favorite was his comment that “Grover would sell his lawnmower to eat at the Bright Star,” referencing that favorite restaurant. Since then, I have wondered what I would have said if I had spoken and what I might have said that was different from what the ministers – Tony Barber, Jim McCain, and Herbert Thomas – had so beautifully said – all of it punctuated by the images on Rick’s video. Dad and Mother were a formidable team for over 63 years. They were independent and occasionally stubborn. As a team, they didn’t always agree; Mother was never the kind of wife who felt bound to abide by her husband’s opinions and Dad always respected and valued that in her. He didn’t try to run her life and she didn’t try to run his. However, she would help him in his work and he would help her in hers. I remember when I was a kid and Dad would bring in extra work to help with family finances; we would all chip in and help – sometimes long into the night. Sometimes Mother would take on extra work with the same results – a family project. There were times growing up when I was a little jealous of my parents’ relationship. They were always good parents to me but they had such a tight bond that I sometimes felt a little out of the loop. Mother and Dad were long-time Sunday School teachers in the 4- and 5-year-old classes at Circlewood Baptist. Many of their Sunday School kids stay in touch and have gone on to distinguished and successful lives, thanks in part to “Miss Jean” and “Mr. Grover” and others who taught with them for many of those years. I remember many Saturday nights when Mother and Dad would be preparing projects for the next morning’s class. Mother and Dad were partners in PTAs throughout their sons’ education, but especially with my brother when they were settled in Tuscaloosa (we moved frequently when I was growing up so there were lots of starts and stops in my education). Eventually, my parents moved through the ranks to become officers in Tuscaloosa’s City Council of School PTAs, with Dad eventually serving as city-wide president for the PTAs. My parents engineered the early success of the shoebox Christmas ministry there at Circlewood, spending hours and hours each fall collecting, monitoring, and delivering thousands of gift shoeboxes packed full of goodies and necessities to be distributed to children around the world. From that start, Circlewood’s Christmas shoebox outreach is still going strong and has grown to be one of the largest among churches in the region. Dad and Mother had each other’s back through thick and thin. Whenever there was a health crisis, they pulled together and pulled through, advocating for one another each step of the way. Occasionally they fought for each other. On more than one occasion I told my parents that I wouldn’t want to be their doctor; they would challenge the medical professionals if they felt they were not being treated well or accurately. I realize now that with the current state of healthcare, their attitude is a wise one. Dad was always a good provider and took care of his family through good times and bad. I didn’t fully appreciate the extent of his commitment to Mother until she had malignant melanoma in 1986 and lost an eye to the cancer. Dad encouraged her and supported her every step of the way – convincing her that she could start driving again, bringing her out into the world again, convincing her that she could go on. She has pressed on with dignity and grace for over thirty years now. When it was Mother’s turn to become a health advocate for Dad, she stepped in with strength and courage. She was resolute and uncompromising every step of the way. During the final five months of his life, while Dad was continuously hospitalized, Mother was at the hospital for hours every day – until Dad was moved 315 miles away to a facility in Mississippi. As soon as she entered the room he would reach out his hand for her and kiss her. She would sit and hold his hand for hours and when she would leave he would always kiss her goodbye. When Dad got to the point where he couldn’t speak for himself, Mother did her homework, got multiple opinions, asked many questions, and made strong and often tough decisions. Once, when Mother was talking to a respiratory therapist who had also become a friend, she was second-guessing herself and some of her decisions and said, “… but I think if the roles were reversed he would have made the same decisions for me.” I was in the room and was the only one who was watching Dad during this conversation. When Mother said she thought he would have made the same decisions for her, Dad’s eyes darted to Mother and he shook his head “Yes.” I was the only one who saw that but it put my mind at ease that he was on board with the extreme measures being taken to try to prolong his life. There are many other memories as well. Dad’s barbecue was some of the finest I’ve ever tasted. His fried chicken wings were amazing and unique and I have never found their match since. Dad didn’t like to make reservations or over-plan a trip; this lead to some pretty roundabout and adventurous vacations and road trips over the years. He was an “Ensley boy” – growing up on Avenue D in the shadows of the steel mills – and anybody who knows Birmingham in the early to mid-20th century knows immediately what that phrase means. Dad would talk about the Ensley boys going across town to take on the Woodlawn boys on occasion. He would talk about riding his bike with his brothers and cousins from Ensley to a swimming hole on Shades Creek and in later years he would sometimes drive around on Sunday looking for that favorite swimming spot. He never could find it and I suspect it’s located somewhere in what is now the Robert Trent Jones golf course at the Ross Bridge resort. Dad was a lifelong and die-hard Alabama football fan. Once, he had to take on Bear Bryant; Dad was setting up the Coliseum for winter registration and Bryant, the athletic director as well as football coach, insisted he needed it for a basketball practice. “That Journey man,” as Bear referred to him, held his ground and said, “Coach, I have been told to prepare the Coliseum for registration tonight and that is what I’m going to do.” Registration set-up went on as planned. I never heard where the basketball team practiced that day. There are plenty of other memories to sustain me. All in all, however, one can’t adequately memorialize Dad without talking about the strength and commitment of his marriage to Mother. I know that would please him. This entry was posted in Grover E. Journey and tagged Alabama Crimson Tide, Chuck King, Circlewood Baptist Church, Dr. Herbert Thomas, Elmood Cemetery, Elmwood Cemetery, Ensley Alabama, Grover and Jean Journey, Johnny Cash and June Carter Cash, Like a Rock by Bob Seger, Paul "Bear" Bryant, Rev. Jim McCain, Rev. Tony Barber, Tuscaloosa City PTA on April 17, 2016 by gedwardjourney.